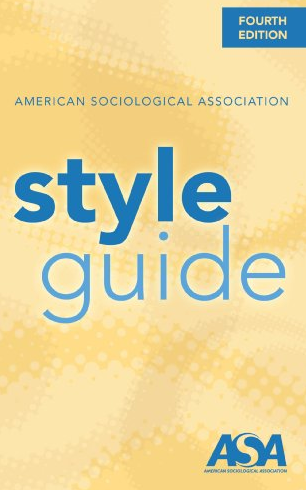 The American Sociological Association (ASA) style guide is based on the 15th edition of The Chicago Manual of Style. This library guide will highlight some of the main items you might cite using ASA style. A complete list of citations can be found in the ASA Style Guide located in the Carmichael Library. Where no rule is listed in the ASA Style Guide, you should use the Chicago Style Guide. For in-text citations, include the last name of the author(s), the year of publication, and page number(s) in parentheses.
. . . in another study by Duncan (1959).
. . . whenever it occurred (Gouldner 1963).
. . . Kuhn (1970:71). *Take note that when including a page number, you should separate the year of publication and the page number with a colon. NO space is included on either side of the colon. Number (Issue Number):Page Number of Article. Gans, Herbert J. 2005. "Race as Class." Contexts 4(4):17-21.
and Job Quality in the United States." American Sociological Review 65(2):256-78. Use the same as above. If the resource is an online resource (NOT from a database), omit the page numbers and include the date of access and URL. If the resource is from a database, include the page numbers as you normally would for a journal article but also include the Digital Object Identifier (DOI). Author, First. Year of Publication. Name of Publication. Location of Publisher, State: Publisher's Name. Webster, Frank. 2014. Theories of the Information Society. New York: Routledge. Author, First and Second Author. Year of Publication. Name of Publication. Location of Publication, State: Publisher's Name. Author, First, Second Author, and Third Author. Year of Publication. Name of Publication. Location of Publication, State: Publisher's Name. McPherson, Barry D., James E. Curtis, and John W. Loy. 1989. The Social Significance of Sport: An Introduciton to the Sociology of Sport. Champaign, IL: Human Kinetics Books. Same as above, but add "eds." after the last author's name with a comma separating the two. Borgatta, Edgar F. and Rhonda J. V. Montgomery, eds. 2000. Encyclopedia of Sociology. New York: Macmillan Reference USA. edited by First Editor, Second Editor, and Third Editor. Locaiton of Publisher, State: Publisher's Name. Social Justice: The Delicate Balance, edited by D. F. Hawkins, S. L. Myers, Jr., and R. N. Stone. Westport, CT: Greenwood Press. When citing sources from the Internet, you should include the names of the authors, date of publication, title of document, publication information, date of access, and the URL.